In case number 8, as an adult mare. Any recent news on Catch A Bird's alleged roan descendants? Its a little difficult to understand how come these important phenotypical cases are practically ignored within the Thoroughbred breed. These cases are breakthrough equines. I posted some interesting information that you might like Jorge on the "Changing" thread. I can copy it to here to keep all of that information together if you would like. Please do so. In fact some of the latest posting from that thread really belongs here, for that other thread is more oriented towards coat color in general than the very interesting and crucial topic of "roans". I perceive this topic as a genuine breakthrough that is unfolding right in front of our eyes, yet so scarce interest is seen among world breeders on this angle (resurrecting the genuine roan color among Thoroughbreds). Imagine we are trying to resurrect a coat color lost for more than two centuries! Alas we have so little information on this strain! Hope this thread may inspire assistance from many others. There is no a haplotype/zygosity test for roan!! 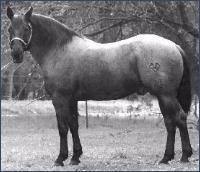 But it is only for QH's and Paints signifying that their may be more than one mutation of roan. 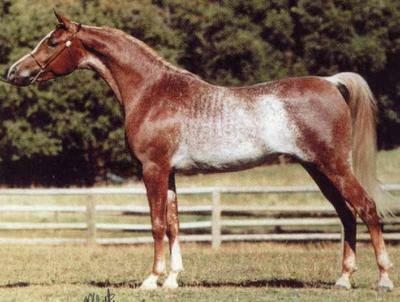 I've always thought that the roan that CAB's offspring was somehow related to rabicano, all of his roan colored offsping have the snow-white tail caps, and rabicano doesn't touch the head or legs. Is there a test for rabicano, if so that would make finding a mutation that much easier. Rabicano also doesnt touch the neck or ANY of the legs really. And True Roan can also color the tail head, and there is nothing stopping them from being true roan and rabicano. Here are some roan stallions with white tail heads (they are also thought to be homozygous for roan.